Small candy dish made from colored pencils cast in clear resin. What kind of resin did you use? I used clear casting resin on this one. Love the bowl. How big is it and how much resin did it take? It is 5” x 3”. I used 20oz of resin on this. amazing idea, and very nicely executed. Don’t see one of these every day … or um..ever – unique – what is your basic workflow?? 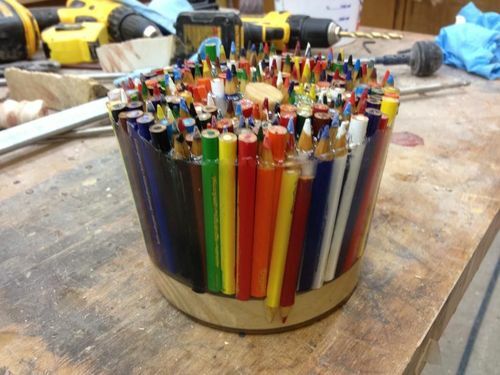 A wicked way to get rid of a lot of colored pencils. This has turned out to be well worth the effort. Great idea John. Wow, very clever process and outstanding eye catching project. Well done sir . Which brand of resin do you use and where do you buy it? Amazing! I think that is super! I have to try one now. It’s going in my favorites. Cool. Very cool. Super cool, in fact! Super cool idea, and beautiful finish. Bob – I used clear cast polyester resin on this one, got it at Hobby Lobby. I am going to experiment with alumilite next. This is a very interesting and unique bowl. I like it a lot. Great job.